This incalmo bowl features six separate sections that come together to form an absolutely breathtaking vessel. Incalmo is an extremely complex technique where each section is made separately and then they are joined one at a time while the glass is still hot. There are several sections of deep and luscious reds and oranges, and several more sections featuring an End Of Day color mix, meaning it is made with a variety of colors used throughout the day. The colors are very deep and intense, contain nearly every color in the rainbow. Make sure to zoom in to see the depth and radiance of color, so amazing! 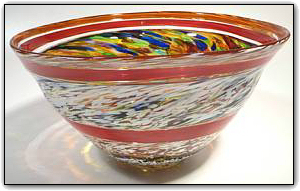 Additionally, this bowl sits at a very slight angle as shown in the pictures, absolutely perfect for frontal display.